This just in: Steve Williams is an idiot. Make that a bleeping idiot. Steve Williams needs to memorize part three of the caddie mantra. We already knew Williams possessed a vastly inflated sense of importance. Now Tiger Woods’ former caddie has revealed a stupid streak as big as his ego. Maybe bigger. In case you missed the latest news, Williams took a stupefying shot at Woods during an annual caddie awards ceremony. First, Williams was roasted by colleagues for his infamous display of self-satisfaction following a victory by his new boss, Adam Scott, at the WGC-Bridgestone Invitational. Taking his turn to speak, Williams explained. “My aim was to shove it right back up that black (bleep),” he said, referring to Woods and an unprintable part of Tiger’s anatomy. The remarks set off another roasting, and not the good-natured kind. Media issued the requisite calls for discipline by the PGA Tour, Scott, and anyone else in position to punish the surly New Zealander. Williams, naturally, issued an apology while Scott stood by his bag man. The Tour claimed its hands were tied and said Williams’ apology would have to suffice. As if this month’s Presidents Cup – where Woods will play as a controversial U.S. captain’s pick while Scott anchors the Internationals – needed any extra drama. There’s a well-known mantra regarding a tour caddie’s on-course responsibilities: “Show up, keep up, shut up.” Williams should learn to follow part three, everywhere he goes. Once upon a time, Golfweek compiled an annual list of the 50 best courses opened in the U.S. during the previous year. Then that list dwindled to 40 in 2009. Now, it’s down to a mere 25 – which covers a two-year period and includes two renovations. Such is the slow state of affairs in the course construction business, victimized by the economic downturn but already suffering growing pains earlier in the decade. The building boom of the 1980s and ’90s, when several hundred new courses came online each year, created a demand-exceeding glut in supply. Things only got worse when the economy went belly-up. Now, more courses are closing than opening each year. It’s sad, for sure. But that’s the free market at work, and far worse things have happened during the downturn. Besides, we’ve got a new Golfweek list to peruse. No surprise at the top: Old Macdonald, the fourth course at Bandon Dunes Resort. Conceived by Tom Doak and right-hand man Jim Urbina, it’s a sprawling ode to Charles Blair Macdonald’s seminal design work at National Golf Links (Long Island), Chicago Golf Club and numerous other Golden Age classics. The second spot goes to an equally intriguing project, The Patriot GC in Oklahoma. Robert Trent Jones II leaned on the men who helped him make Chambers Bay (Wash.) such a smash, Bruce Charlton and Jay Blasi. The trio hit another home run, carving a compelling course from a rugged, boulder-strewn chunk of northeast Oklahoma. What makes The Patriot truly special is its purpose. The club is home to the Folds of Honor Foundation, the brainchild of PGA professional and F-16 pilot Major Dan Rooney. Folds of Honor provides scholarships to the kids of service members killed or wounded in Iraq and Afghanistan. 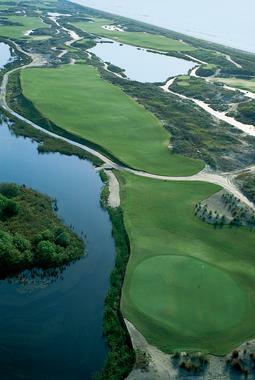 The Patriot is a private club, but sets aside three tee times a day for one-time public access. Ten percent of the $150 fee goes to Folds of Honor. If you’re in the Tulsa area and covet a tee time, or just want to contribute to the cause, visit www.patriotgolfclub.com. All hail Luke Donald, the undisputed No. 1 golfer in the world. Technically, Donald has stood atop the world golf ranking since May 29, when he unseated fellow Englishman Lee Westwood. But there’s been plenty of clamor in the meantime, his critics arguing that Donald hadn’t done enough to earn the top spot. Nevermind that no one else had, either, since Tiger Woods abdicated the throne last year. The major-less Donald, who went five years without a PGA Tour win (2006-2011), was an easy target. With his incredible come-from-behind victory at the Children’s Miracle Network Hospitals Classic in Orlando, Donald silenced the doubters. Six straight birdies and a closing 64 were his polite way of saying “Shut up,” in proper King’s English, of course. As a bonus, Donald leapfrogged Webb Simpson to claim the tour’s money title with a cool $6,683,214 on the year. That’s even more impressive when you consider how much he plays overseas. In fact, Donald’s in position to win the European Tour’s money race as well, which would make him the first person to take both in the same year. Luke Donald: Did we mention that he played alongside Simpson for all four rounds of the CMN? Or that Donald was two shots behind his playing partner, and four shots off the lead, with eight holes to go? Disney trappings aside, this was a gutsy performance. It may just have locked up PGA Tour Player of the Year honors, too. Donald was one of seven players with a pair of wins this season (not counting two in Europe) and by far the most consistent of the bunch. The lone missing piece to his resumé remains that elusive major. At age 33, his time is now. Sergio Garcia: While Donald was busy stamping his signature on the 2011 season, Garcia marked his resurgence complete with an 11-shot victory at the Castello Masters. The Spaniard thrilled a home crowd with a final-round 63 to lap the field, dedicating his win to the late, great Seve Ballesteros. Having emerged from the oblivion that was 2010, Garcia may be poised to finally fulfill the potential he flashed as a teenager and 20-something. Welcome back, El Niño. David Duval and Ben Curtis: A pair of former Open Championship winners, Duval and Curtis failed to earn exempt status for the tour in 2012. Duval, who seemed to be inching (ever so slowly) back to something like his old form, slipped to 152nd on the money list by missing the CMN cut. Curtis did likewise to finish 149th for the year. Ben Crane is a funny guy, but he was all business Sunday at the McGladrey Classic. Perhaps best known for his series of quirky YouTube videos and his role in the laughably bad “Golf Boys” routine, Crane ran down Webb Simpson with a final-round 63, then won on the second playoff hole. All this while his wife was in Dallas prepping for the birth of the couples’ third child (scheduled to arrive Monday via C-section). For good measure, Crane nearly withdrew from the McGladrey Thursday with an aching hip. As for Simpson, it wasn’t all bad. He overtook Luke Donald for the PGA Tour money lead with one event remaining. The pair will slug it out for the title this week at the Children’s Miracle Network Hospitals Classic in Orlando. Crane, understandably, is skipping the event. Too bad – we were hoping for a duet with Mickey Mouse. Bud Cauley: The curly-locked Cauley, a 21-year-old from Alabama, finished T15 to earn $64,000, plenty to put him inside the top 125 on the money list. That gives Cauley PGA Tour exempt status for 2012 – in other words, no Q-School for Bud. He’s just the sixth player ever to take the express route to the Tour; the others included Tiger Woods. Tom Lewis: Speaking of Woods, he was one-upped this weekend by Lewis, an English phenom who won in his third professional start. Actually, Lewis two-upped Tiger, who took his sweet time before winning on the fifth try. Lewis blew past a bevy of veterans with a final-round 65 at the Portugal Masters. You may have watched the 20-year old in July during the Open Championship, where his Thursday 65 was the lowest round by an amateur in the event’s history. Greg Norman: Maybe the Shark should put a gag order on himself. Then again, his mouth may have already done its damage. Clearly, Norman believes Woods is washed up. How else to explain his weekend comments stating that Keegan Bradley should’ve gotten the Presidents Cup pick that U.S. captain Fred Couples spent on Tiger. Psst, Greg: You’re coaching the other team! It’s not that we disagree with Norman. On the contrary, we’re with him 100 percent. But we’re not coaching against Tiger! Neither is Couples, who takes a step closer to looking like a genius every time Norman opens his yap. Officials from the USGA and Ping met yesterday in Dallas to discuss the use of Ping Eye 2 clubs on the PGA Tour. Can you believe these people get paid to have such ridiculous meetings? All of this groove craziness is enough to make your head spin. At least we don't have to deal with it directly - like the pros on the PGA Tour. Actually... that would be awesome! Just being on the PGA Tour would be well worth the groove nonsense. Am I right? "We met with representatives from Ping yesterday. Our conversation with Ping regarding the status of the Ping Eye 2 irons on the major professional American tours was productive, and we are hopeful that a solution can be found that respects and reflects the best interests of golfers and the game."